New ‘Ex e’ Standard Published EN60079-7:2015. Several Major Technical Changes to ‘Ex e’ and the end of ‘nA’? “eb” terminals in Ex e are now to be subjected to insulation material tests. Also requirements for securing cables have been expanded to allow the use of an X condition. Soldered connections used in Ex e – requirement for a means of mechanical support for connection such that it does not rely solely upon the solder. 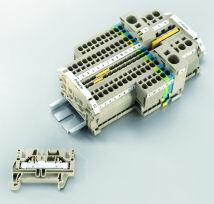 Pluggable connections – Requirements for pluggable connections have been separated out to give requirements for levels of protection of “eb” and “ec”. Requirements for “ec” have been brought in from EN 60079-15. External plug and socket connections for field wiring connections. (Not classed as a major tech change but appears to be). Bring the requirements for plugs and sockets from 60079-15 as “ec”. Also appears to allow the use of a plug and socket assembly for “eb”. Not previously included. The minimum IP rating for Group 1 enclosures has been amended for IP20 to IP23. Requirements for Lamps – Tungsten halogen lamps have been added as a potential light source, spacing requirements for lamps below 10W, requirements have been included for bayonet style lamp holder, added requirements for abnormal testing of discharge lamps (previously only tubular fluorescent lamps) etc. Text has been amended to clarify the requirements of routine tests for terminal enclosures, including information on when routine tests are not required. Details have been include to clarify the requirements for the marking of component certified enclosures. Marking shall be internal and does not need to be permanent. Only manufacturers name and serial number can be marked externally, again this can be non-permanent. Marking can be omitted if the Ex component enclosure manufacturer is also intended to be the holder of the equipment certificate, this has to be detailed in the schedule of limitations. ‘Marking of “nA” is replaced by Ex ec and this brings in new requirement such as a means of ‘mechanical support’ for connection (such that it does not rely solely upon the solder), requirements to check solid insulating materials (to ensure it is used within the limits of its thermal stability and new requirements for lamps in luminaires. Details have been include to clarify the requirements for the marking of component certified enclosures.